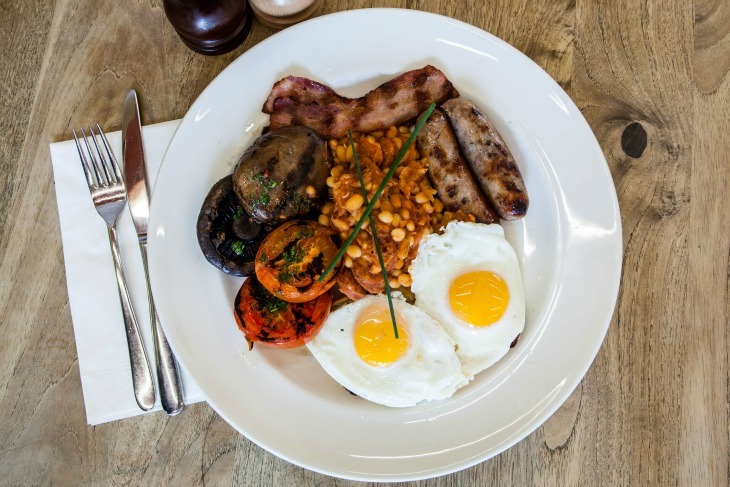 Recently, we considered the reasons why London loves a greasy spoon. Chipped mugs brimming with tea the colour of Katie Price, eggs spluttered in a pan until frilly at the edges and sauce squirted onto juicy bangers all form part of the answer. 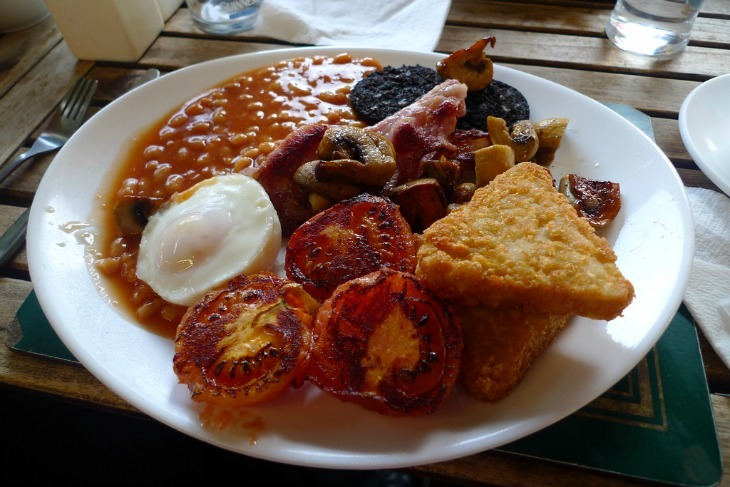 The full English breakfast is one of the most recognised traditional British dishes, usually comprising several parts of pig (bacon, sausages, black pudding), fried eggs, baked beans, toast/fried slice and the odd token vegetable, such as a grilled tomato or fried mushrooms. It will either set you up for the day or send you straight back to bed. It's not hard to find a fry up in London, but quality varies and success hinges on more than just the requisite components being present, or even the quality of them. A cheery welcome and cosy surroundings can earn customers' loyalty, particularly at the greasy spoon end of the scale. We've got room for them all. Here’s our list then of the top fry-ups in London, from the family caffs to high falutin restaurants. Vegetarians — we’ll be covering meat-free versions in a separate shiny article so please, don’t think we’ve forgotten about you. E Pellicci, Bethnal Green: We start with a spot that’s a favourite of many Londoners, not just the locals. This Grade II listed East London landmark has Formica-topped tables surrounded by wood panelled walls. One of the best old Italian cafes, it's famous for generous portions with a garnish of East End banter. To enter Pellicci's is to walk into a bygone era. It's fabulous. The famous fry up at Maggie's, Lewisham. Photo by Ewan Munro on Flickr. Maggie’s, Lewisham: This café close to Lewisham station seems to be packed at any time of day, but the breakfast is famous dahn saaaf. You can create your own from a choice of more than 20 items including liver, for those who like a bit of old school punch with their morning meal. Mario’s, Kentish Town: Another family business, Mario’s is always full of regular customers. The fry up isn’t anything spectacular, but if it’s a friendly face and a chat you want with your breakfast then this is the place for you. People talk about the owner Mario as if he is more family than friend. It’s also the café about which St. Etienne’s 1993 song ‘Mario’s Café’ was written. Hawksmoor Guildhall: The full English breakfast at Hawksmoor Guildhall will set you back £16 — this ain’t no greasy spoon — but it is exceptional. A sausage is made with pork, beef and mutton to a Victorian recipe, and there’s great quality bacon, black pudding, fried eggs, hash brown, tomato, baked beans cooked with pig’s trotter for an extra gelatinous sauce and toast. Ooof. Mighty meaty. The Hawksmoor breakfast. Photo: Ewan Munro on Flickr. Riding House Café, Goodge Street: The ‘full and proper’ breakfast at Riding House Café is indeed comprehensive, comprising all the usual suspects, including a mercifully roasted, not grilled tomato. The latter is so watery and insipid we’re amazed anyone ever eats it. The beans come in a dinky pot too, which should appease those of you who have a thing about the beans touching the other elements of the breakfast without permission. What, us? Never. The River Café, Putney Bridge: We feel the need to start this entry with the customary ‘no, not that River Café’ disclaimer, and so we just have. You might want to avoid this place when Chelsea are playing, but otherwise, fill your boots. The fry up is classic, with decent, thick cut bacon and those triangular hash browns that are often more satisfying than freshly made posh versions. 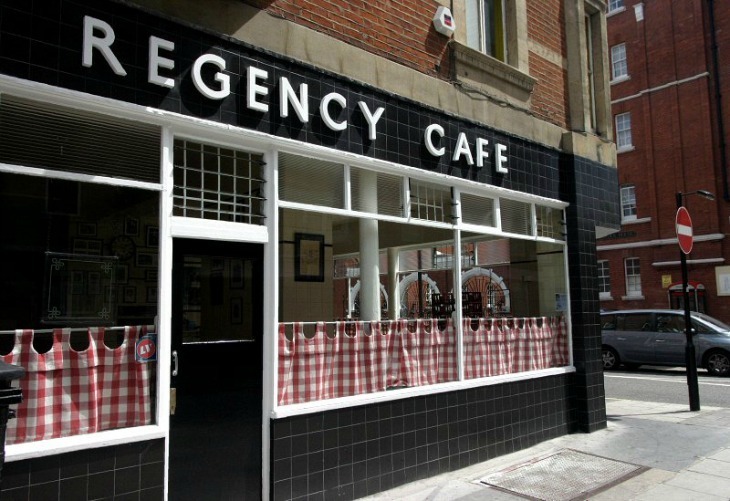 The Regency Cafe by Stef on Flickr. Regency Café, Pimlico: Another art deco caff here, and another popular and rowdy spot. It has been used, famously, as a filming location on several occasions and is best for those who like their fry up with an accompanying side dish of shouting. The lady behind the counter barks out the orders with such ferocity it will wake you from the deepest of sleepy morning states. The Wolseley, Piccadilly: The Wolseley would never put anything so common as a 'fry up' on its menu, so the breakfast here is listed as ‘ The English’. It comes with your choice of eggs, bacon, sausage, black pudding, beans, tomato and mushroom and will set you back a mere £16.50. 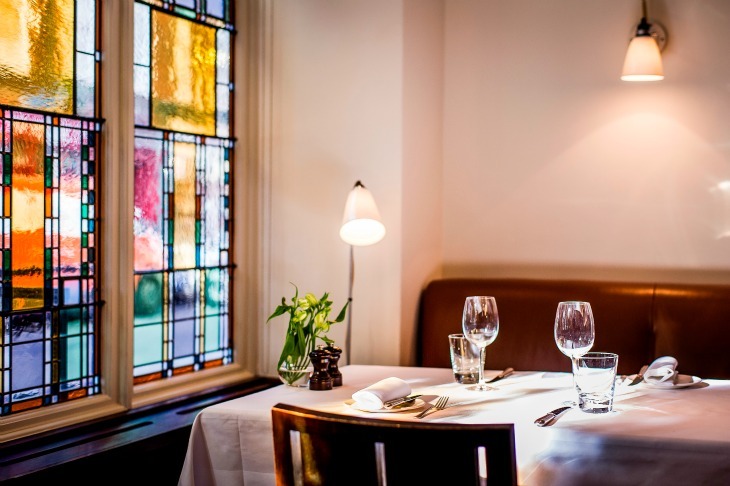 Here, you’re paying for the cooking, but also the grand Viennese café style surroundings, the history and the people-watching potential. 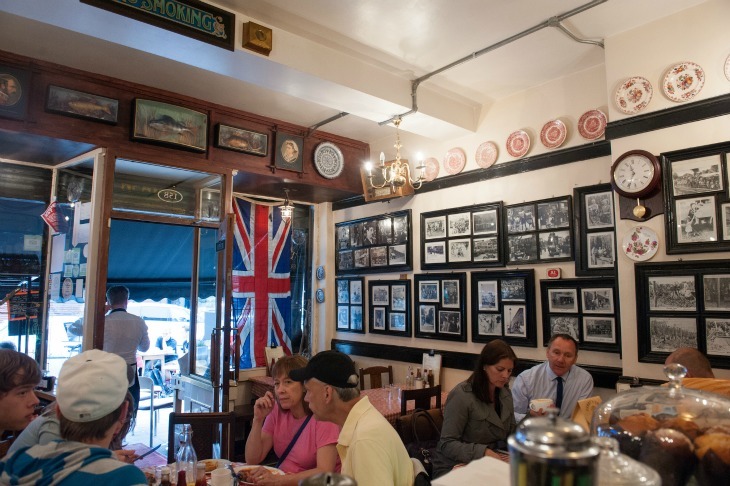 Terry’s Café, Borough: Terry’s sells itself as a thoroughly British experience. It's now run by Terry’s son Austin, who prides himself on offering a very traditional menu, including of course a full English. There are various options according to hunger levels, and we love the cosy feel of this caff with its checked plastic table coverings and fascinating old photos covering the walls. The interior of Terry's Cafe. Photo: John Pannell on Flickr. My Tea Shop, London Bridge: This cracking little caff serves up reliably no nonsense fry ups. Frills you will not find here, but you will get plenty of things that many people would describe as ‘proper’ by which they mean good strong tea in a mug, and hand sliced bloomer loaves. Quo Vadis, Soho: Another rather more sophisticated take on the FE at Quo Vadis, where 12 quid will get you your essential pig trio of pudding, sausage and bacon, plus egg, roast tomato (hurrah!) and fried bread. The produce here is fantastic, and the cooking too. Enjoy the beautifully serene dining room as you charge forth into steaming eggs and sip English breakfast tea (pinky up, naturally). Also note the beautifully designed menu which features everyone's favourite egg — Humpty Dumpty. Breakfast in style at Quo Vadis. Photo: Paul Winch-Furness. The Orchard, Brockley: You'll need to pounce like a German at the pool to snag a table at The Orchard, as it fills up very quickly with locals. The breakfast is one of the highlights, and it's particularly popular at weekends. One of the best things about The Orchard, however, is that it's right opposite another gem, The Gantry (see below), which is the place to head if you've difficulty getting in (or vice versa). The Gantry, Brockley: The Gantry not only serves a cracking breakfast, it's gorgeous inside too, like a warren of rooms to be discovered, ending in a large, bright conservatory leading to a rambling garden. Proper Alice in Wonderland meets The Secret Garden stuff. With eggs. Liz Cafe, Shepherd's Bush: There's a very pleasing no nonsense approach to breakfast at Liz's — the portion is massive, there's loads of toast and it comes in at a reasonable price. You're ticking our boxes, Liz. Funky mushroom toast at Caravan. Photo: Ewan Munro on Flickr. 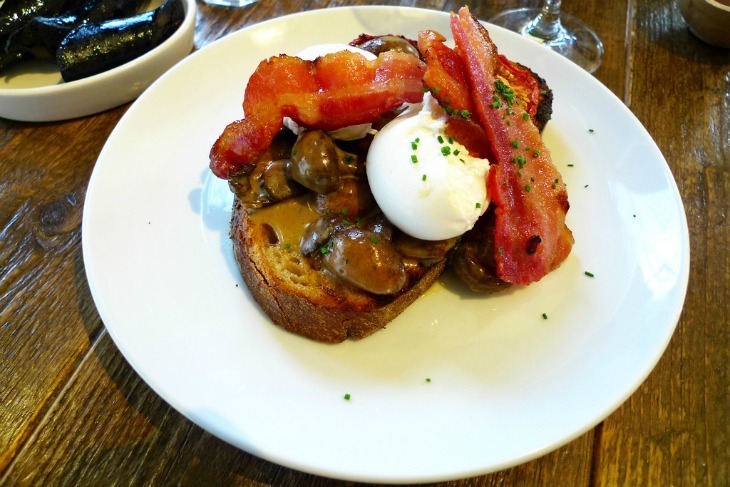 Caravan, Exmouth Market: We’re big fans of the creamy soy mushrooms at Caravan which come with streaky bacon, your choice of eggs, and slow roast tomatoes and part of their fry up. Usually we’re not a fan of the stacking approach when it comes to plating up, but in this case the sauce from those mushrooms works wonders on the toast and so we’ll make an exception. Caravan, 11-13 Exmouth Market, EC1R 4QD. Price: £9.50 but no sausage. Bistroteque, Bethnal Green: A most enjoyable breakfast can be found at Bistroteque, with the sunniest of eggs just set on top, crisp tongues of streaky bacon and layered potatoes which have been cut as thin as leaves and baked. They call it brunch, naturally. Jackson and Rye, Chiswick, Richmond and Soho: We don't care much for Richard Caring's mini chain at any other time of day, but the breakfast and brunch are pretty fine. The 'Farmer's' is maple bacon, eggs, a sausage patty (careful, Richard), 'home-style' potatoes (fried, basically), spring onion and granary toast. We particularly appreciate the fact that the bacon comes in 'slabs'. The Modern Pantry, Clerkenwell: This light, bright room makes the full English feel modern. 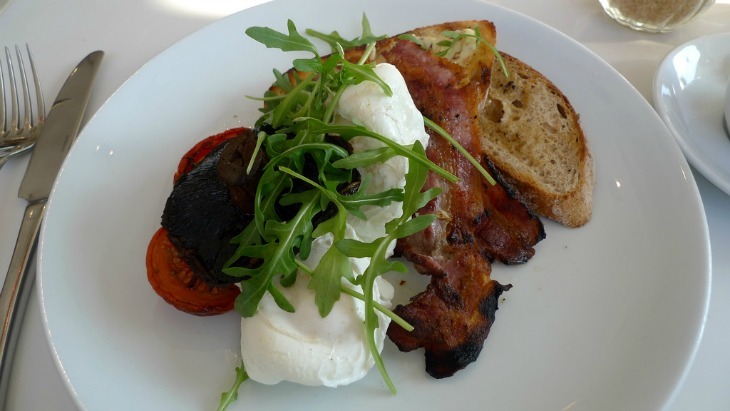 Choose poached, scrambled or fried eggs to go with smoked streaky, buttered mushrooms and roast tomato. How do we feel about rocket on a fry up? At The Modern Pantry. Photo: Scott Dexter on Flickr. 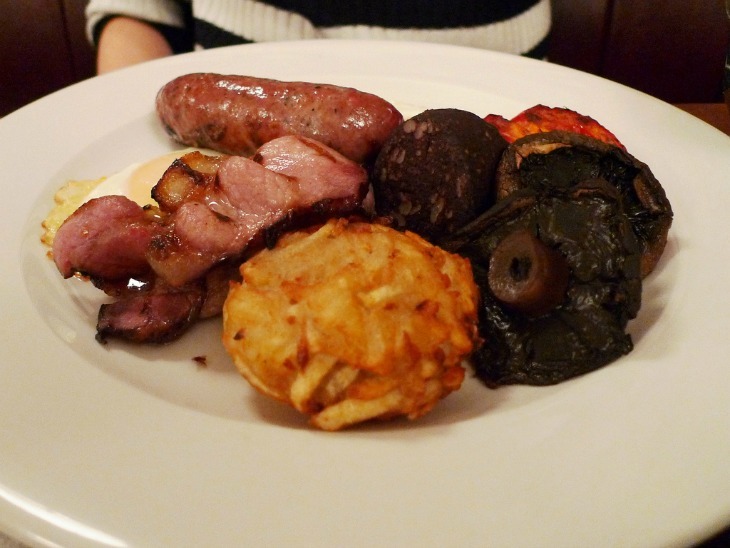 Ffiona's, Kensington: This British restaurant serves a fry up which has the advantage of being absolutely massive. You'll get all the usual suspects plus a healthy helping of chips, which we're not sure we agree with... actually scrap that, there's always room for chips. 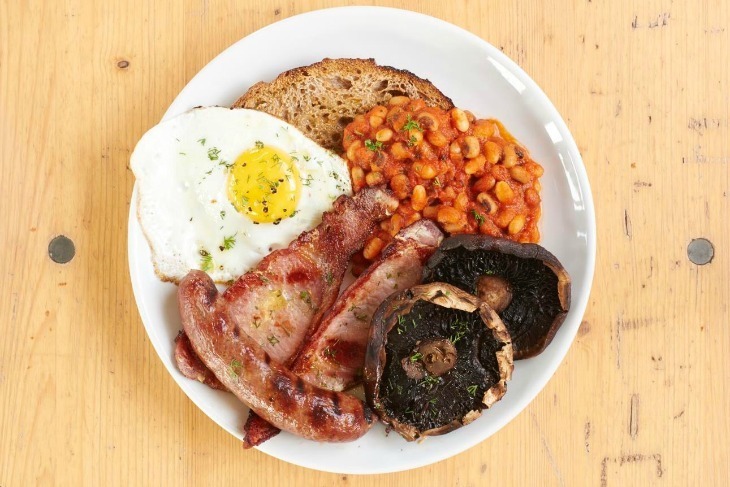 The Blues Kitchen, Brixton: This south London favourite offers an almost traditional full English, with one twist — BBQ beans. We were reluctant to include such a variation but they actually sit surprisingly well alongside Cumberland sausage, bacon and eggs. The Pavilion Cafe, Victoria Park: It's an unlikely spot for a decent feed in London, but we promise you it's true. The fry up at Victoria Park's Pavilion cafe is deservedly famous. Enjoy Ginger Pig bacon, their own sourdough, organic beans, Square Mile tea or coffee and an excellent view over the lake. The inevitable downside here of course is that it's a very popular spot, so you'll need to be a keen bean to get yourself a table. The Pavilion Cafe breakfast. Photo: Pavilion Cafe. The Garrison, Bermondsey: This pub has rightly earned a reputation for breakfast, providing as it does a fine assembly of protein on plate. The banger is particularly herby, yet doesn't clash with the rest of the decidedly traditional elements. We wanted more toast on our last visit, but overall, a high grade way to start the day. Pedler, Peckham: This popular Peckham restaurant and bar took the place of Nigerian restaurant Delta Tavern a few years back, and although we have fond memories of cow's foot stew sloshed down with frosty cans of Stella, we can't say we're not happy that Pedler moved in. You can always rely on them to add their own twist, and so along with the usual bacon, sausage and eggs you'll find a pig's head croquette, and toast with maple salted butter. The Borough full English at The Table Cafe. Photo: The Table Cafe. The Table Cafe, Borough: The weekend brunch at this out of the way, smart cafe is top of its game. 'The Borough' full English comes in at a high price point for the area, but the quality means it's worth every penny. The baked beans in particular are the star component here, made with chorizo and ham hock, just in case you felt there wasn't enough meat involved already. Bring it. Honest Burgers, Liverpool Street, Clapham, Tooting and Peckham: Selected branches of Honest Burgers now serve brunch, and very good it is too. The usual bacon/sossidge/black pud combo comes with fried egg, garlic mushrooms (respect), bubble and squeak (more of this, please), their own beans and sourdough. This is excellent value for the quality. Honest Burgers, Clapham, Liverpool Street, Tooting and Peckham branches. Price: £9.50.